As we all gather to spend time with our family and friends, I would like to ask you to keep the Fabbro family in your thoughts and prayers. Rhonda Fabbro, an exceptionally special staff member, died on Sunday, December 23 of colon cancer. Those of you who have attended Georgetown for the past six years, will remember Rhonda Fabbro. She had many roles in our building from driveway crossing guard to kindergarten para-pro to lunch recess supervisor. Rhonda was also a willing volunteer for any special activity that took place at Georgetown. It’s likely that you remember Rhonda and her ginormous sweet dog, Barrett, crossing kids across the driveway before or after school. They were quite the team! Some people who deal with the needs of young children or those with behavioral/physical/trauma needs experience a point of compassion fatigue. Not Rhonda. Her heart had an endless capacity for those who were most at-risk and she often chose to support those with her own funds — or forgoing pay to step in and help others out at school. Rhonda also had a wicked sense of humor — a professional like delivery of dry humor. She could walk through the lounge, make a single dry comment and cause the entire group to explode with laughter at a time when it was most necessary for us to laugh and breathe. I remember most her commitment to helping others — especially children and their families. One of my fondest memories includes Rhonda and her daughter Isabella volunteering to welcome our kindergarten families during fall open house, taking photos and greeting each family as they entered the building. During the grade 1-5 Open House, Rhonda would stand at the entrance to the driveway, dressed up and cheerfully welcoming families back to school. 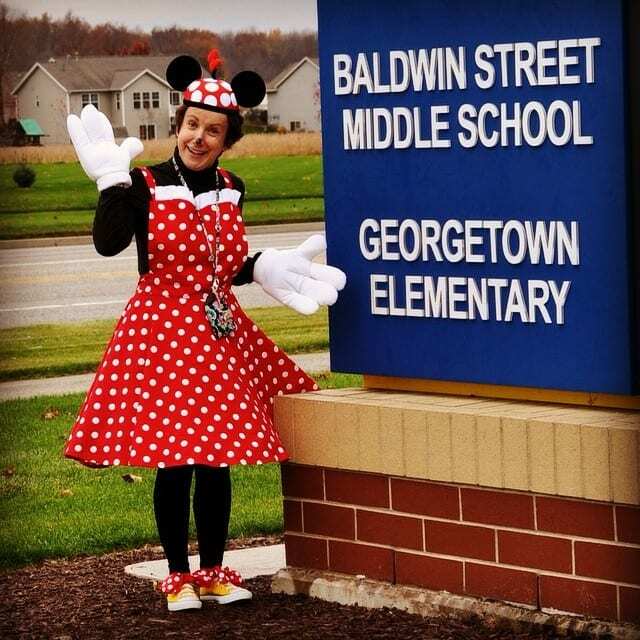 Above is my absolute favorite photo of Rhonda — dressed as Minnie Mouse — welcoming families to school in 2017. Rhonda left an imprint in our lives and her spirit is woven into the tapestry of our school family. My heart aches with the loss of Rhonda — and I find myself also aching for her husband Art and two high school age children, Isaiah (12th grade) and Isabella (10th grade). Please keep this very special family in your thoughts and prayers today and throughout the holiday season. For those interested in service details, follow this link. For those wishing to express condolences, the address for the family is below. Previous post: ONLY ONE YOU … A Very Special Wall! Next post: Week 18: HAPPY NEW YEAR!